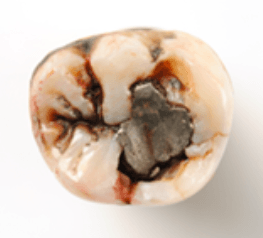 A crown restores your tooth by placing a strong, beautiful cover over it – much like a thimble goes over your finger. Fillings break down and leak allowing cavities (holes in teeth caused by germs) to begin under the filling. Crowns are made of strong, corrosion-proof materials, unlike fillings, so they last a long time and provide protection to the tooth. 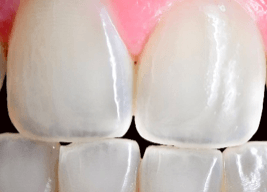 Large fillings and decay have made this tooth weak and easily broken. Fillings leak eventually and a cavity begins under the filling. This doesn’t hurt – at first. By the time cavities hurt, a root canal (treating infection in the nerve of the tooth) is often needed. The cavity may be so big that the tooth can’t be fixed. Costly and time consuming work may need to be done to fix the problem. In some severe cases, the tooth may be lost, and a more expensive implant (a small post placed into the jaw) or bridge (artificial teeth)would be needed. If a root canal has been done on a tooth, it is more brittle and likely to break. 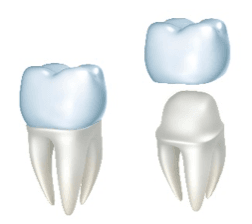 A crown protects the tooth from breakage and possibly losing the tooth and the investment made on the root canal. Sometimes a crown is the only way to make a tooth look nice. WHY DON’T I JUST WAIT UNTIL THE TOOTH BREAKS TO CROWN IT? When a tooth breaks it can be much harder to repair – if it can be repaired at all. The tooth on the left is so broken down that it can’t be restored. The picture on the right shows how the area looks once the tooth is extracted (removed); now a bridge or an implant will be needed to replace this tooth. Broken teeth often need to be fixed with root canals and/or gum surgery, increasing the cost and making it much more difficult and expensive to save the tooth. WHY DO SOME CROWNS LOOK FAKE OR HAVE A BLACK LINE AT THEIR BASE? You won’t know a good crown when you see it because it just looks like a beautiful tooth! Crowns that look fake or have black lines are done with older technology which doesn’t allow the beauty and function we can achieve today. They also may be made of cheap materials that just aren’t as nice as what we use.